Tapered roller bearings have been in existence since the early 20th century and remain an ideal, versatile roller bearing for many applications, can tolerate multi-directional loads and operate well at high speeds. The nomenclature and load ratings differ slightly for tapered roller bearings compared to ball bearings or other types of roller bearings. Instead of an outer ring, tapered roller bearings have a cup; and instead of an inner ring, tapered roller bearings have a cone. The remaining bearing components, the cages and rollers, are referred to similarly in other bearings. The tapered roller bearing’s rollers have a distinct shape; a tapered shape, hence the name. This tapered roller has a line contact between the raceways of the cups and cone(s), as opposed to oval or circular contacts with spherical roller and ball bearings respectively. Another primary difference between tapered roller bearings and other bearings is the difference in capacity definitions. Dynamic capacity is often the ideal method for defining a bearing’s loading ability as it resists fatigue. Dynamic capacity (C) is the load at which 90 percent of a given group of bearings will meet or exceed one million revolutions. For tapered roller bearings the dynamic capacity (C90) is defined at ninety million revolutions. At first glance the lower values of the tapered roller bearing’s published dynamic capacities appear deficient to the dynamic capacities of other roller bearings due to the different base of comparison. To compare C90 to C on the same base, multiply C by 0.259. There are many advantages of tapered roller bearings. For starters, since the roller is tapered and angled between cups and cones, it can easily support a variety of directional loading. Its ability to support combined heavy thrust and radial loads surpasses spherical, cylindrical or needle roller bearings. Most standard mounted tapered roller bearings can support pure radial, pure axial and any combination of those two types of loading scenarios without modifications. 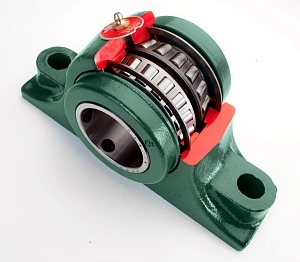 The tapered roller bearing’s geometry allows true rolling motion of the roller between the raceways, which means the rollers are unlikely to skid or slide when unloaded. Other roller bearings have minimal load requirements to insure the roller actually rolls and does not slide between the raceways. Skidding or sliding is harmful because it sweeps the lubrication away from the surfaces, which will lead to wear and premature failure. Tapered roller bearings have high load capacities. These capacities far exceed ball bearing limitations and rival similar spherical roller bearing capacities. However, it is important to note that there are a few areas where tapered roller bearings have disadvantages. Tapered roller bearings do not tolerate dynamic misalignment well. Due to raceway and roller geometry, spherical roller bearings support dynamic misalignment much better. Tapered roller bearings also have static misalignment limitations however, in some applications the bearing housings can be designed so the bearing can self align properly. One of the other disadvantages is with speed limitations. Although tapered roller bearings can operate successfully at high speeds, ball bearings can exceed the tapered bearing’s speed limitations and generate less heat at the elevated speeds. Many tapered roller bearings are available as mounted units such as pillow blocks, flanges, piloted flanges, and take-up units. These mounted units are often pre-lubricated and offered with a variety of seals for a broad range of applications. The cones of these mounted units are configured specifically for quick bearing-to-shaft installation through setscrew, tapered adapter, eccentric locking or clamp-style attachments. Mounted tapered roller bearing units are typically offered with two rows of opposing rollers. The rows can be oriented as either converging or diverging orientations. Converging orientations are often provided with two separate cups and have contact angles where the apexes of each row of rollers converge near the centerline of the bearing assembly. Diverging orientations are often provided with two separate cones and have contact angles where the apexes of each row of rollers diverge away from the centerline of the bearing assembly. Converging orientations are the most common because the assembly is less involved and provides slightly more forgiveness to misalignment. Diverging orientations are considered to be more stable and resistive to moment loading. Unitized configurations are also common for tapered roller bearings and allow for misalignment expansion capability. Unitized configurations are tapered roller bearing assemblies mounted within a housing that has a spherical outside diameter or rib. These units are then assembled within a flange or pillow block. The assembly works similar to a ball-and-socket joint where the unitized bearing assembly swivels relative to the anchored bearing housing. Common configurations allow for up to 4° of static angular misalignment. These unitized assemblies are also available with expansion capability to prevent preload from thermal shaft growth or contraction. Tapered roller bearings are common in many applications. Gearboxes and gear sets, particularly those utilizing helical gears, use tapered roller bearings due superior performance with multi-directional loading. Mounted tapered roller bearings are common with fans exposed to high axial forces, agricultural equipment, mining and aggregate machinery, aggressive machines used with wood products, forest and paper products as well as general industrial applications. Galen Burdeshaw is Baldor customer order engineering manager with Dodge bearings and PT components. For more information, visit www.baldor.com.